We love beer. But many of our favorite microbrews aren’t sold in bottles. 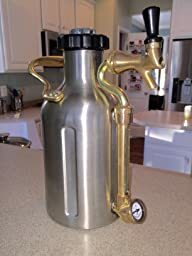 The uKeg is the world’s most innovative draft beer growler. It keeps beer fresh, cold and carbonated, and goes wherever you go. Toast to flavor and friends. With a uKeg, your favorite beer will stay brewery fresh to the last pint, whether poured from your refrigerator or from your tailgate. After ordering our Growler from the Kickstarter campaign back in 2014, we finally received the product in January 2016. Despite the long wait and lack of updates, we couldn’t be more excited to try out the Growler. We secured the CO2 cartridges and filled the growler for the first time. However, immediately on filling there was a constant leak near the sight tube, where the tubing connects to the Growler itself. We immediately contacted GrowlerWerks directly for a fix – either a replacement or parts – either would suffice! However, well over a month later, we still have yet to hear back from them, and thus no fix. We now have a growler that doesn’t hold in beer and is essentially useless. When my uKeg arrived it was broken, the faucet had snapped off the gooseneck. OK, i get it… things happen during shipping. I also noticed that the brass components that create the site glass and the faucet did not match in color; each were slightly different. So when I contacted Growlerwerks about the broken part, I was sure to mention the discrepancy in colors as well. After about a month, my replacement part arrived. I had hoped they would just send me a new unit, but alas they sent me a new faucet which I then had to tediously assemble. I finally got it assembled using these strange proprietary tools they enclosed. After assembled the faucet works, but just barely. The action on the tap handle feels “questionable” and it drips rather persistently after dispensing a beer. Also, the brass parts are still mismatched. 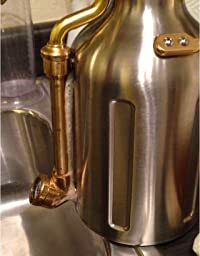 I again emailed Growlerwerks about the issue and they noted that some of the components had just tarnished and would need to be polished. Why the F do I need to polish brass that is supposedly brand new. OK, fine, I’ll polish the brass. Well I did and low and behold the tarnish is gone but the brass parts still don’t match. Absolutely horrible craftsmanship. Very disappointed. I was really disappointed by the quality of the product. It arrived soaking wet in its bag, not even sure how that could happen. The metal was scuffed, scratched and had black marks all over. All the parts were haphazardly fastened and nothing was straight. Definitely made in China with no oversight. Returning as soon as possible.